When it was first introduced in 2008, the new Constitution of the Republic of the Union of Myanmar was deemed to be a great improvement over the previous constitution. An important part of this was the more robust guarantees it included for human rights. And an important part of the latter was its relatively strong guarantees for freedom of expression. At the same time, the guarantees for freedom of expression in the 2008 Constitution do not fully meet international standards in this area. 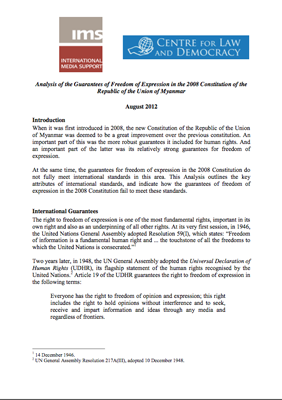 This Analysis outlines the key attributes of international standards, and indicate how the guarantees of freedom of expression in the 2008 Constitution fail to meet these standards. Can Fact-Checking contain Sri Lanka’s many Pinocchios? International Media Support (IMS) is a non-profit organisation working to strengthen the capacity of media to reduce conflict, strengthen democracy and facilitate dialogue.